Use GreenLight, a web application that utilizes natural language processing, to “debug” your relationships. 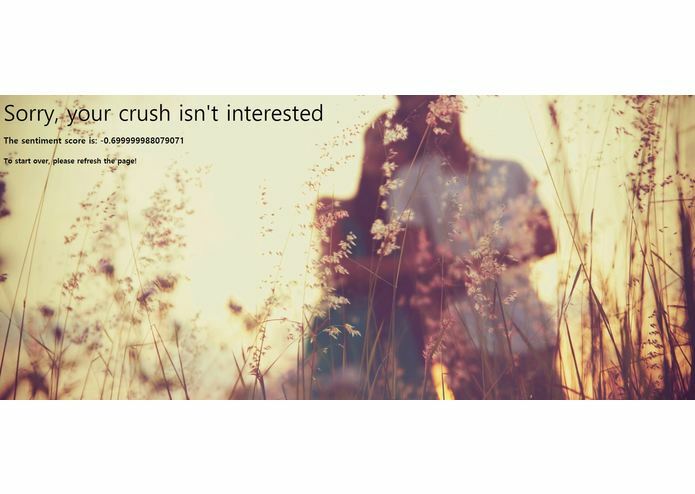 The result shows whether your crush is interested in you or not. We know that we should proceed when the traffic light turns green, but we all falter in front of our crushes. What is the “green light” to make a pursue? Designed to tackle this problem, GreenLight allows you to discover the underlying sentiments in the words of your crush. Type up a few sentences that your crush said to you in a txt file, and GreenLight will help you do the work. On a scale of -1 to 1, GreenLight evaluates how much your crush likes you. The more information you enter, the more accurate the results will be. Aside from the romantic enigma, GreenLight can also help your unravel other complicated relationships in your life. We used flask, python, html and css to build the web application, and used Google’s natural language processing API to analyze the text file sentiment. As freshmen, all of us were unfamiliar with web development, so we encountered many technical difficulties. We are glad that we are able to make a functional application, whiling learning new things on the way. We learned to develop a web application and use external APIs to process information. More importantly, we learned how to collaborate as team and work together to accomplish a goal. We would love to expand on its functionality and improve the user experience. For instance, the app may read in messages directly from texting tools, such as the Facebook messenger. In the future, GreenLight may also process speech to analyze the sentiments in different tones.